(WASHINGTON) — When Michael Cohen appears before Congress in the coming weeks, he plans to describe details of life inside the Trump Organization boardroom that he witnessed firsthand for nearly a decade, his lawyer told ABC News. 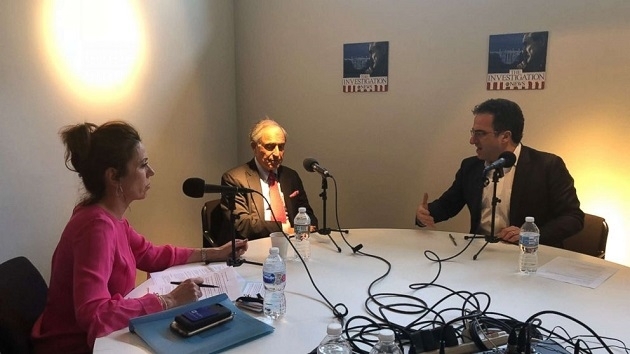 “He needs to tell his personal story to the American people,” Lanny Davis, Cohen’s attorney, said in a wide-ranging interview for the second episode of “The Investigation,” a new podcast focused on the probe led by special counsel Robert Mueller. Davis shared for the first time with ABC News details about the topics Cohen plans to cover when he finally appears. Davis said that while Cohen cannot talk about subjects vital to the special counsel investigation, he can describe his life at Trump’s side, where he spent years as a lawyer and fixer. He said the issue Cohen “can speak to better than anyone” is President Donald Trump’s character. Cohen pleaded guilty in August to six felonies associated with his personal business dealings, including tax evasion and making false statements to a bank, and two felony campaign finance violations in connection with his role in arranging non-disclosure agreements during Trump’s campaign with two women who had claimed past affairs with the president. In November, he pleaded guilty to lying to Congress about a Moscow real estate project that Trump and his company pursued at the same time he was securing the GOP nomination in 2016. Cohen has on repeated occasions scheduled, and then canceled, appearances before Congress in recent weeks. The president and his advisers have made no secret about how they plan to rebut claims made by Cohen, repeatedly describing him in media interviews as a dishonest broker who will say anything to try and reduce his impending prison sentence. “The man is pathetic,” Trump lawyer Rudy Giuliani told ABC News Chief Anchor George Stephanopoulos in December on This Week. Davis compared such comments from the president and his team to mafia tactics. He took issue with a tweet from Trump describing Cohen as a “rat,” a euphemism for “snitch” that Davis said could put his client in danger when he reports to prison. “It sounds like wishful thinking to me,” Davis said. What he knows, Davis said, is that Cohen contributed “70 hours and seven days” of interviews with the Mueller team. Whether the public is ready to accept Davis’ portrait of Cohen as a changed man — “transformed” was his word — remains to be seen. While the special counsel did credit Cohen’s cooperation, prosecutors in the Southern District of New York were not as swayed. Davis has deep experience in the trenches of political scandal, combining his legal background with his expertise in public relations. He served as special counsel to President Bill Clinton, guiding him through a series of fractious political investigations, including an impeachment trial born out of his affair with White House intern Monica Lewinsky. Davis, who spent 12 years representing Maryland in the Democratic National Committee, provided a harsh assessment of the Trump tenure, but also expressed some concern that Democrats risked overplaying their attacks on the president.